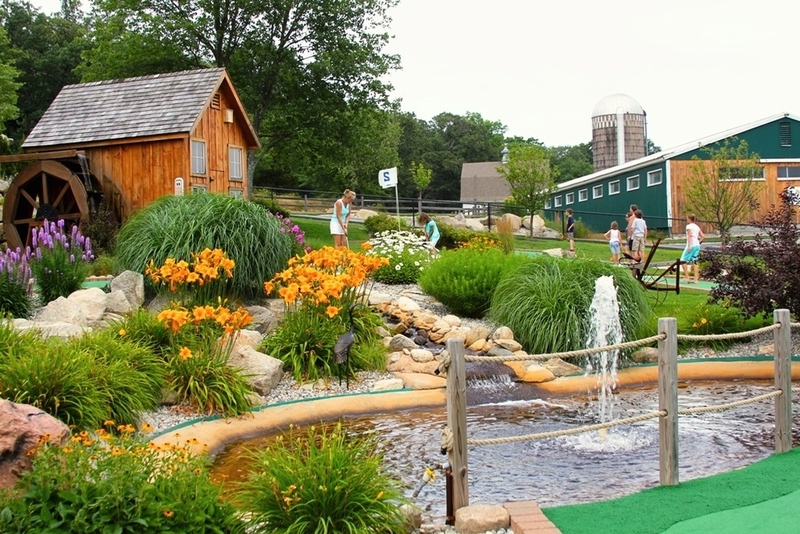 Enjoy a cone of delicious ice cream or try a round of golf on our beautiful 18 hole miniature golf course. Jump in with both feet on the Barnyard Jump or get lost this fall in our 5 acre a-maize-ing corn maze! There’s SO much to discover at our Family Farm. West End Dairy began in the late 1910's with a small herd of Holstein cows. Located on the 'west end' of Whitinsville, the dairy operated a retail milk route covering the towns of Northbridge, Sutton, Uxbridge and Millville until 1968. The wholesale milk operation continued until 1987. Nothing beats Peanut Butter Cup! West End Creamery opened in 1999 and serves over 175,000 guests each season. Our 65 flavors of top quality, local ice cream are sure to please! Located right next to Purgatory Chasm State Reservation and with easy access to Rt 146, West End Creamery is the perfect Family Destination. Take a look at our 2018 flavor options! Let us know your favorite! We have a few seasonal options such as Pumpkin and Dutch Apple Pie. In addition to the tried and true, we add new flavors and specialty sundaes over the course of the season. Shortly after the turn of the century, our family began farming this land on the west end of town. What started out as a flock of chickens soon turned into a dairy farm called West End Dairy. Our herd of Holstein cows provided fresh milk and cream and was peddled door to door here in the Blackstone Valley until 1968 and then we switched to a wholesale milk market for the next 20 years. Fast forward to 1999 and the 4th generation, Greg VandenAkker and his wife Becky, began West End Creamery with a goal to preserve our family farm and to share our heritage. Today, we still work the land growing hay, pumpkins and feed corn and the fun of agritourism bringing people like you to our farm, so you can enjoy our land along with us!